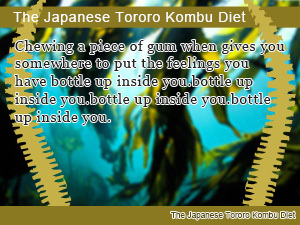 Tororo Kombu brings a new facet of nutrition to your diet for weight loss. With the benefits of seaweed you can start eating less without going hungry. Shredded seaweed ("Tororo Kombu") such as Gagome-Kombu comes with many great health benefits for dieting and losing weight including optimal nutrition helping your get vitamins and minerals you need to build on the success of your weight loss plan eating right. What is one of the best seaweed to eat? There are many Benefits of Seaweedsuch as preventing overeating. 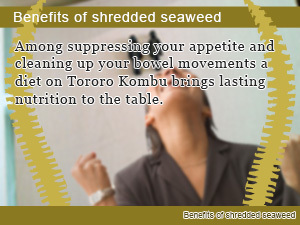 In particular shredded Tororo Kombuseaweed has the effect of filling up your stomach helping you get full faster in addition to being a great metabolism boosting food that promotes healthy bowel movements. Surely, you would not want to be without this special seaweed food. Getting your fair share of seaweed vitamins is as easy as adding more seaweed such as Japanese Tororo-Kombu to your meals. Other than that there is no need to be overwhelmed with strict dietary shackles when on the Tororo Diet just beautiful slimming. In this daily Slism, we take on the Japanese Tororo Kombu diet diving into health benefits of eating seaweed to satisfy your appetite eating less, block fat in your diet, and explain why eating too much seaweed can be harmful to your body. All you need to do to make your Japanese Tororo Kombu diet work is simply add this shredded brown algae seaweed to your daily meals. That means finding a way to eat seaweed for breakfast, lunch, and dinner. There are no restrictive rules. The only thing you will need is Tororo Kombu to eat. When adding shredded seaweed to your meals, eating seaweed before or after your main meal is all okay. Note that eating shredded seaweed after a meal takes away the initial purpose of eating Tororo Kombu in the first place. Tororo Kombu can be added to Miso Soup or just poured over a bowl of rice. How you eat shredded seaweed is up to you. The important thing is that you get it in your body before are during meals for best results. Shredded seaweed can be eaten before a meal as is in raw form or added to a broth mix or even hot water for easier consumption. It is recommended that you get around 10g of shredded seaweed on the Tororo Kombu diet. That leaves room for 3g of shredded seaweed that you will need to consume with each meal. Note that by eating more will not produce better results. 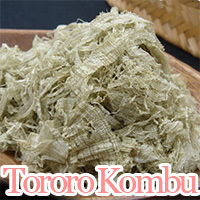 It is more important that you continue eating Tororo Kombu for improve lifelong health. Shredded seaweed such as Tororo Kombu from Japan is rich in nutritional value such as vitamins, minerals, and dietary fiber advantageous to anyone looking to get more leverage on weight loss built-in their diet. In addition the Calories in Tororo Kombu are so low. It only contains 15 calories per 10g serving size! Imagine being able to eat less without having to listen to your stomach complain all night long. Shredded seaweed soaks up fluids as it enters your body quickly expanding sending out a signal to your brain warning your body that you will soon be full. That is why simply eating Tororo Kombu before or during meals works as a great way to get full eating less allowing you to cut calories eating. For best results eat shredded seaweed either before or mid meal to prevent unnecessary overeating form ruining your diet plans. Tororo Kombu is rich in dietary fiber that attaches itself to fat in your diet flushing fat out of your body greatly reducing the amount of fat absorbed by your body during meals. The dietary fiber in shredded seaweed acts as a fat blocker by helping transport fat throw your body shielding it from being absorbed by the walls of your stomach and intestines. Never was there an easier way to flush fats in your diet through your body without having to rely on risky dietary supplements than simply eating shredded seafood. When you are constipated harmful toxins build up in your intestinal tract creating harmful bodily waist products that slow down your metabolism. Remedying constipation is not only important in boosting your metabolism but also works to improve the condition of your skin, an effect you can get out of your diet not to be missed. Tororo Kombu is an excellent source of dietary fiber and is a highly effective food at to remedy constipation in your diet. Consuming the right amount of shredded seaweed makes a great preventative measure against constipation leaving your digestive tract left clean. Although there is not much to be said about eating too much Tororo Kombu, however as it stands, eating too much shredded seaweed may negatively affect your health. Like many other seafood, Tororo Kombu is very high in Iodine, which actives hormone growth in your thyroid gland. Although this is said to boost the metabolism of fats and sugars, not getting enough carbs and fat in your diet can lead to a feeling of weakness. In short, getting too much iodine in your diet may affect the function of your thyroid glands. Don't worry too much because as long as your stay within the recommended levels of consumption you shouldn't have to worry about eating shredded seaweed affecting your health. That just goes to say that more doesn't always mean better. When it comes to reforming your sequential eating order, there is no better than starting each meal of your day with dietary fiber for a healthier you. Have a big game coming up soon? Do it like Ichiro. The morning curry diet is not fad it’s a lifestyle choice that comes with many benefits. Learn how you can start your day with a bang now! Rice bran is considered a food for healthy skin amongst helping to prevent from overeating and reliving constipation, the rice bran diet gives you tools. There is no better fruit diet plan than dieting on avocados to get the best natural detox you can buy out of the bottle with beauty enhancing skin care in every bite. Gagome kombu is not only healthy and contains optimal nutrition eating a small amount before each meal may help you lose weight. Among suppressing your appetite and cleaning up your bowel movements a diet on Tororo Kombu brings lasting nutrition to the table. 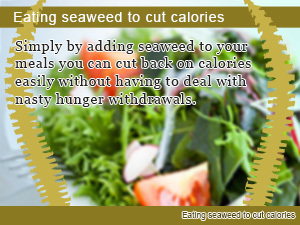 Simply by adding seaweed to your meals you can cut back on calories easily without having to deal with nasty hunger withdrawals.